Cebu hosts some of the best diving spots in the Philippines, an official of the Department of Tourism (DOT) 7 said. DOT 7 Director Rowena Montecillo said some of these dive sites are found in the Camotes Islands off Cebu’s fourth district, Bantayan Island off the northernmost tip of Cebu mainland, Mactan Island, Malapascua Island and in Moalboal town in southern Cebu. Earlier, Tourism Secretary Ramon Jimenez said the DOT will promote the country’s diving industry and make the Philippines the number one destination for underwater activities. Montecillo said she believes there is a need to step up the campaign to pitch diving in the country and involve particularly local government units (LGUs). Part of the initiative is to hold discussions with the LGUs on concerns about the uniformity of user fees and the preservation of coastal resources. ”There has to be a proper set of guidelines,” Montecillo said. Jimenez was in Cebu to grace three-day Dive Expo and Exhibition Philippines (world Deep) held at the Shangri-La Mactan Resort and Spa which ended Sunday. The dive expo, which was organized by the DOT, Philippine Commission on Sports and Scuba Division and the Philippine Association on Underwater Activities, also showcased alternative underwater sports that have yet to gain a wide following in the country. At least 130 underwater federation leaders from all over the world attended the expo. Montecillo said the dive expo will help increase the country’s footing in the scuba diving scene. She said the country has a lot to offer, considering that it still has a lot of unexplored diving sites. She said divers are considered a “lucrative market” because they are high spenders and long-staying guests with a minimum stay of five to seven nights. She said Europeans, specifically divers from France, frequent Cebu and Bohol for diving. 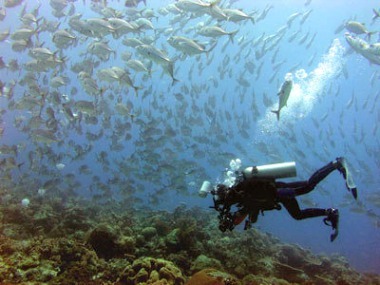 The region is also seeing an increase of foreign divers from Japan and South Korea.